You’ve made it to the mecca of country music, Nashville, Tennessee. Put on those boots and head on down to Broadway to listen as the music fills your ears and sets your soul afire. You’re here where stars are born, amateurs get a chance, legends are made and royalty reigns. Here in the hallowed halls of the Country Music Hall of Fame, on the stages of the Grand Ole Opry and the Ryman and on the streets and alleyways of downtown, music is masterful and country is king. Here you can pop yourself in the costumes of darlings of the genre, line dance with the best of them and walk through the footsteps of history. Get your dancing boots ready… you’re in for a phenomenal time! 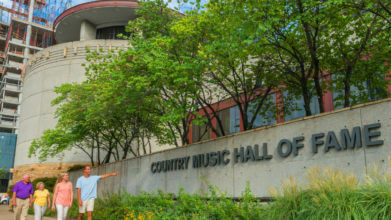 You’re in Nashville and you’re ready to take on the legends and the lessons of country music at the mac daddy of them all – the Country Music Hall of Fame. Here you’ll experience the evolution, influence and impact of the entire genre of country. You’ll walk through decades of artists and discover their albums, their outfits and their entire journey from amateur to stardom. Check local guides for discounts, book tickets in advance, spend as many hours as you need and bring the entire family along for the ride. Those legendary pews, those voices of newcomers on the same stages as music giants – this is Nashville at its best. Whether you’re spending time at the Grand Ole Opry or The Ryman, be sure to book your tickets in advance to be able to breathe in the aura of all things country. There’s something special about being there. The radio announcers speak into these microphones, performers take to the stage with grace and ease and once in awhile, a country legend stops by to surprise the audience and steal the show. In a sea of onlookers, young and old, the magic of the arena holds your attention and the talent of those on stage capture the entire evening. Somehow, Nashville finds a way to imbue country music into almost all things and all places. Get your line dancing on at the Wildhorse Saloon. Spend some time backstage at the Opry to learn about the legendary halls and the voices that have graced them or take a look at posters of times gone by at the Hatch Show Print Shop. 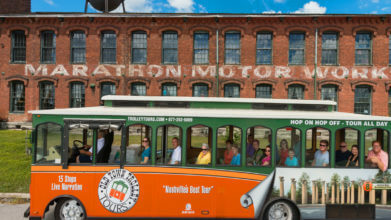 Whether it’s dinner and a show, a selfie with a wax figure, a walk through the homes of the rich and famous or standing amidst the history of Tootsie’s Orchid Lounge in awe of the names who walked in as amateurs and out as legends, music history has made its mark on Nashville and is sure to make its mark on you.